This morning I was pleased to welcome Poway Unified School Board Area B Candidate Ginger Couvrette. Ginger has an incredible track record of volunteerism in our community helping children, athletes, needy families, special needs students and teachers in the Poway Unified School District. I have always known of Ginger as a community dynamo helping out so many people throughout Poway, but I was amazed to learn that she has done so much more. Ginger often pointed out how the positive at Poway Unified and overall how people are happy. She doesn’t want to take sides, but rather surround herself with intelligent people that can work together to solve problems. Ginger is a former science teacher at Poway High and San Marcos High. Couvrette spoke about the need for district-wide procedures and protocols on issues like student safety, bullying and student anxiety. She wants to have a consistent set of standards with citizen oversight so teachers, parents and administrators have consistent expectations when important situations arise. She also talked at length about the vocational training she experienced in high school and how these innovative programs can be implemented to at PUSD to provide better educational and career-testing opportunities. Ginger shared her story of helping save the Poway Days Parade and enjoying working closely with Sue Herndon and Heather Dugdale. They joined forces again and joined Jody Campillo to create Jack-O-Smash to help raise money for special needs students at PUSD. Over 3 years they raised $70,000 which they offered in $500 grants to all PUSD special needs teachers at all schools that requested help. The event involved a 5K race, giant trebuchets that launched pumpkins great distances and a softball game with special needs athletes and current & former Padres and other MLB players. Ginger also discussed her experience on the City of Poway’s Budget Review Committee and the best practices she learned that could be brought to Poway Unified. This included a clear prioritization of special projects that could be pursued with one-time money from the state or from surpluses. The City of Poway also has a disciplined process where departments budget and save for capital expenses years in advance. For example, if a department needed to buy a truck that would last 8 years, then they would buy the truck, but immediately begin saving in year 1 and each year thereafter. Then when that truck needed to be replaced the funds were available to buy the next truck by year 8. The end result is a disciplined process that includes citizen oversight of individual department budgets resulting in a long string of balanced budgets and healthy reserves. 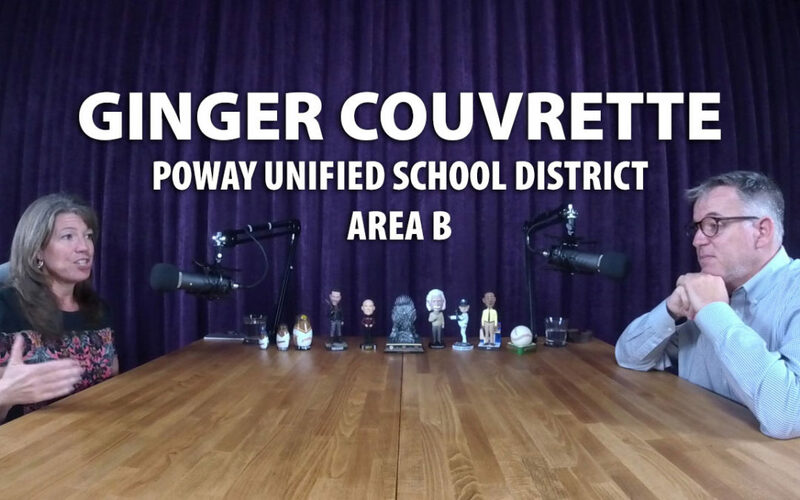 This is one example of many where Couvrette identifies programs that work in other places that can be rolled out at Poway Unified as a successful program. We also spoke about special needs students and their needs, unnecessary legal battles, the natural human concern about change in light of the new superintendent and her new cabinet, tightening up the business side of the district, streamlining and automating processes to save time and money, Pomerado Elementary’s new technical center, school foundations, ROTC, agriculture, the 3-2 board majority dynamics, field trips, cross country, her son building and driving the Cal Poly SLO Rose Bowl Parade float, turf at Valley Elementary and Meadowbrook Middle School, lights at Arbolitos Field and Valley Elementary, Poway Sports Association, Poway soccer, football, Poway High Tennis, Poway High Water Polo, Palomar Pomerado Pathmaker internship, Thanksgiving baskets at Chaparral Elementary and the Poway High Rugby Club. The list of community organizations that Ginger has helped is endless.